Gay rights protesters have marched in the Latvian capital, Riga, despite an angry reaction from conservatives. Some of the marchers held placards with messages such as "Love is a human right," "Equality is a human right," and "No to hatred, we love Latvia". Last year, a meeting of gay rights advocates attracted angry protesters, some of whom threw eggs and excrement. The police, who were accused of ignoring those attacks, provided tight security for Sunday's parade in a park. Extra fences, two cordons of police and riot police outnumbered both the pride activists and anti-gay protesters. One paint bomb and a couple of what appeared to be fire crackers were thrown into the park and protesters jeered as marchers went past, but otherwise the event was trouble-free, reports the BBC's Laura Sheeter in Riga. It was the second gay pride march to be held in Riga. The first was in 2005. One marcher, a member of Latvia's ethnic Russian minority, told AFP news agency: "Many people in Latvia, which only recently emerged from the Soviet Union, don't know what 'gay' is. They confuse it with paedophilia." 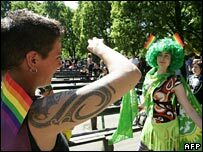 Linda Freimane, a board member of Mozaika, Latvia's foremost gay rights group, said the parade was an important step for the gay community in the Baltic states, which joined the European Union in 2004. "If we don't do it again this year then we give in to the illegal, violent forces who can limit other people's rights just by smothering them," the Associated Press news agency quoted her as saying. On the other side of Riga's old town, an anti-gay gathering called the World Against Homosexuality attracted about 1,000 people - more than attended gay pride but far fewer than the 50,000 people the organisers had hoped for. Gay rights activists have been concerned at the violence shown during a recent rally in the Russian capital, Moscow, which saw foreign dignitaries and gay men punched and kicked in front of police. They also condemned a recent decision by Lithuanian authorities to stop an EU vehicle which promotes tolerance and diversity from visiting the country, saying it would anger homophobic elements.